Want to stun your friends and family with visual beauty at your Easter celebration? You’ve probably heard the old adage that “We eat with our eyes”. 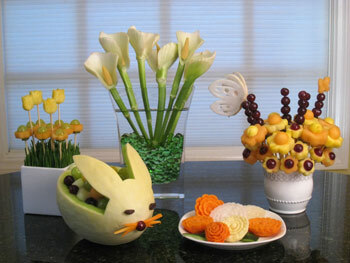 Making Easter fruit carvings to your food presentation can really raise the WOW factor of your party. We have a whole bunch of Easter Carving Ideas for you throughout our blog. We also have some great lessons and tools that will make carving for Easter celebrations fun and easy. I’ve consolidated most of our Easter related premium lessons, free lessons, and Easter Patterns to this one page so that you can easily look over your choices. We’ve recently introduced a few new products. We’ll start with those. If you want create some eye catching melon Easter baskets full of fresh fruit, then you will love our Basket Weave lessons. You can use this technique to make watermelon, honeydew, and cantaloupe baskets. A melon Easter basket full of fresh fruit is sure healthier than a basket of candy. The recipients of your baskets will find them to be an unexpected surprise. 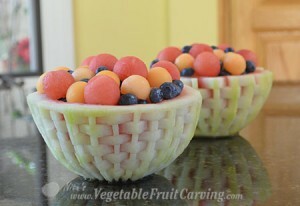 The melon basket weave pattern taught in our step-by-step lessons can be carved on honeydew, watermelon, or cantaloupe. 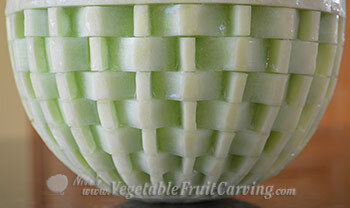 Find out more about our Melon Basket Weave video lessons here. Create watermelon carvings like these with our Easter Patterns. 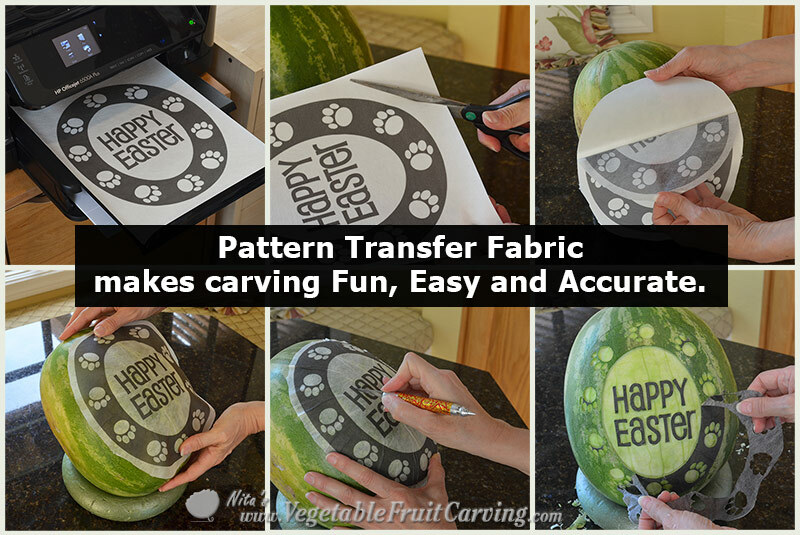 We’ve got some brand new Easter Fruit Carving Patterns that make carving a special Easter watermelon quick. No need to struggle with creating your own pattern that is appropriate for carving. Just print and start carving. You can print our Easter patterns on any paper. For best results, our Pattern Transfer Fabric is highly recommended to use with these Easter patterns. You simply print, trim, stick the pattern on, carve, and remove the pattern remnants. To make your pattern carving super easy, we’ve got a Pattern Transfer Fabric that makes carving any printable pattern faster and easier than ever before. Just print the pattern of your choice, peel off the backing and stick it to your melon. Smooth it down and you are ready to carve. You carve right through the pattern, like tracing. This is SO MUCH FASTER and EASIER than the old method of poking dots, and it gives you a clear, easy to follow pattern (unlike when you poke dots). Once you try this wonderful Pattern Transfer Fabric, you’ll never want to go back to old methods again. We offer this is trial size packs and in 50 sheet packs for prolific carvers. If you carve for personal entertaining, your family and friends will be impressed. Don’t be surprised if family and friends ask you to make carvings for special events. 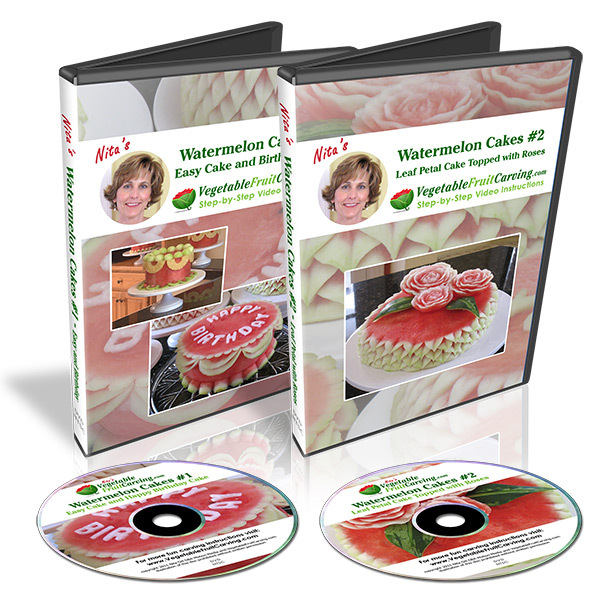 If you are a caterer or other food service professional, you’ll stand out from the crowd and have people requesting your marvelous custom melon carvings. If you are new to carving patterns onto watermelons, you’ll enjoy learning all you need to know in our lessons Carving Letters and Words. The techniques taught in Carving Letters and Words apply carving graphics onto watermelons and pumpkins, too. 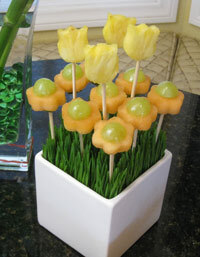 Nita’s Honeydew Melon Bunny can be made with cantaloupe or any other melon. 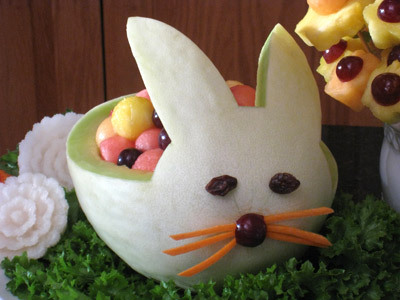 For Beginners, we have lessons that show you how to make this pretty Melon Bunny. The white flowers that you see to the left of the bunny are taught in our lessons, Yam and Turnip Flowers and the fruit bouquet to the right is taught in our video lessons, Bouquets and Butterflies. 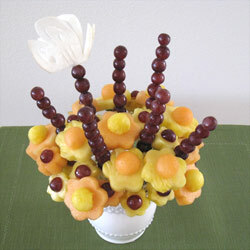 Individual serving fruit bouquet would be fun for an Easter brunch. In the same set of video lessons as the Melon Bunny, you’ll find our how to make pretty Calla Lily flowers that are symbolic of Easter. 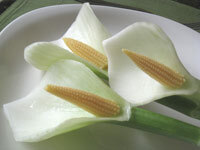 These Calla Lilies can be used in a place setting or as a bouquet. 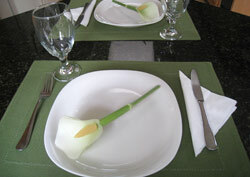 Single carved vegetable calla lilies make an elegant table setting. All of these lessons, Melon Bunny and Calla Lily, Yam and Turnip Flowers and Bouquets and Butterflies that make perfect Easter fruit carvings are taught in my Vegetable and Fruit Carving 101 Course for Beginners. Vegetable and Fruit Carvings that are Perfect for Spring that are taught in our Vegetable and Fruit Carving 101 Course for Beginners. Although most of these lesson and tools are not specifically for Easter, they make lovely Easter food decorations. One more set of lessons that you may like for Easter is Amazing Carving with Jimmy Zhang. 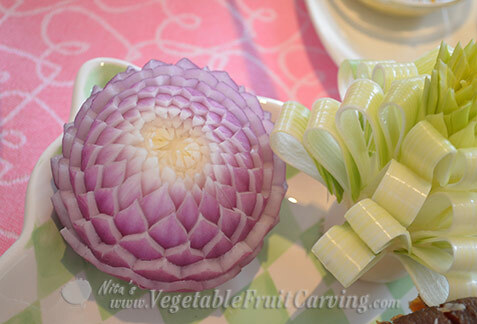 You can learn how to make these 3 lovely vegetable bouquets in Amazing Carving With Jimmy Zhang lessons. The bright and pastel colors in these centerpieces would be a pretty addition to any Easter table. If you are looking for a free lesson that will show you how to make a pretty and easy radish bouquet like the one pictured below, sign up for our free lesson here or at the top right of this page. You can get this free step-by-step lesson by signing in for the free lesson at the top right of this page. One more free lesson that you might like to put to use for Easter is this pretty purple onion flower. I mentioned it in a previous post about Easter Garnishes. It’s easy to make and can serve as a pretty garnish to a serving platter. I have a free lesson showing how to make this pretty purple onion flower. 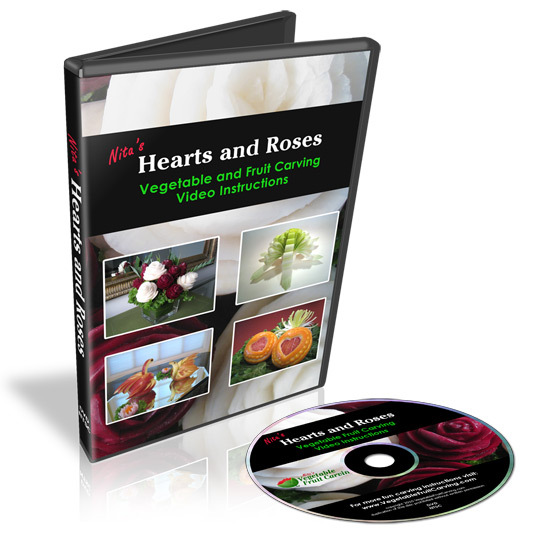 The leek ribbon flower is taught in the 101 Course. You can shop for all of these lessons and tools in our Easter section of our shop. Whatever Easter fruit carving you choose to create, your guests will be surprised and delighted. Have fun. Where can I get carving tools?